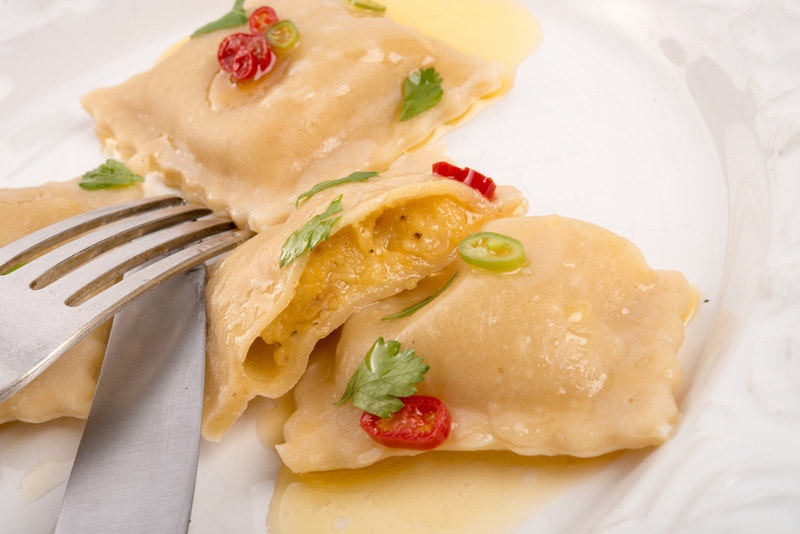 Enjoy this homemade pumpkin ravioli year round with this simple recipe! Homemade always tastes better! Pumpkin Ravioli is a really authentic Italian dish, as pumpkins grow really well in Italy, particularly in the south of the country where it’s lovely and warm. What better way to combine pumpkin with the traditional ravioli than with a few herbs and some garlic and Parmesan cheese? It is a really tasty meal. Pumpkin harvesting in Italy is usually a festive and fun affair – typically Italian, they make a huge event out of everything! Families get together and go from one pumpkin farm to another, harvesting in separate days at each one, followed by a sumptuous feast, and knowing the Italians, copious amounts of wine, music, and dancing! I’d love to go to one of those festivals one day, but it’s quite a long haul from where I’m located! There are also pumpkin festivals throughout the country, not just in the south, one of the most famous beings in Venzone where the event is very spectacular and goes on all day! Clowns, jugglers, fire-eaters, knights and ‘damsels in distress’ all feature in this extravaganza, which culminates in a ‘largest pumpkin’ competition, and pumpkin carving. The local restaurants then take up all the pumpkin flesh and make the pumpkin ravioli we are showing you, plus many others. The dish is quite rich, so tends to be eaten in small quantities as part of a feast. Indeed Pumpkin pasta recipes are very popular during festivals. A hearty meal that everyone is certain to love! Mix all of the ingredients together, excluding the lasagne sheets. Set aside. Soften the lasagne sheets in boiling water for a few minutes, this makes them easier to cut. On a floured board, place the lasagne sheets in 4 rows of 2 sheets. Evenly space out 1 ½ tsp of the mix along 4 of the lasagne sheets. Top with the other lasagne sheets, pressing down gently. You should be able to make 4 ‘ravioli’ out of each of the sheets. Using a pizza wheel or a crinkle roller cutter, cut the ravioli into parcels. Make the sage butter by melting the butter in a large frying pan until foaming, throw in the sage and fry for a few seconds. Remove the pan from the heat, add lemon juice and pepper. Leave on top of the oven to reheat quickly before serving. Bring a saucepan of water to the boil (make sure you use a large enough pan) and drop in the ravioli one at a time, so they don’t stick together. Bring back to a rolling boil for approx 2 minutes and remove each ravioli with a slotted spoon, to drain off the water. Briefly, reheat the sage butter, place a portion of the ravioli into each bowl and pour over the sauce. Top with the fresh Parmesan and serve. 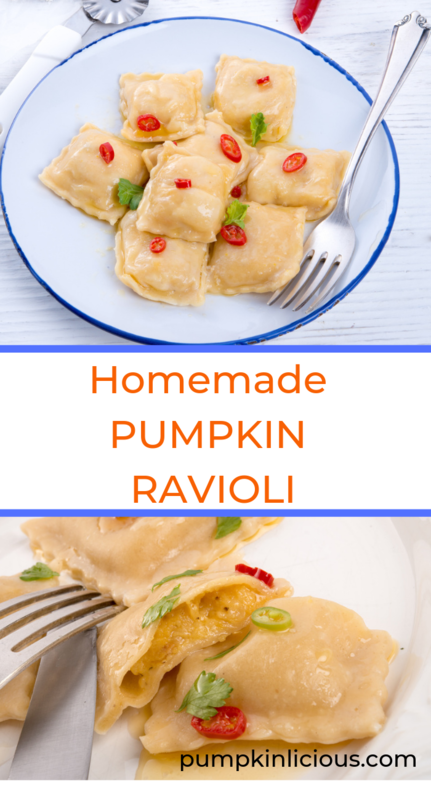 Do you enjoy ravioli with fun flavors like pumpkin?